A family from Baisari of Myagdi district preparing to leave their village due to landslide threats Thursday. 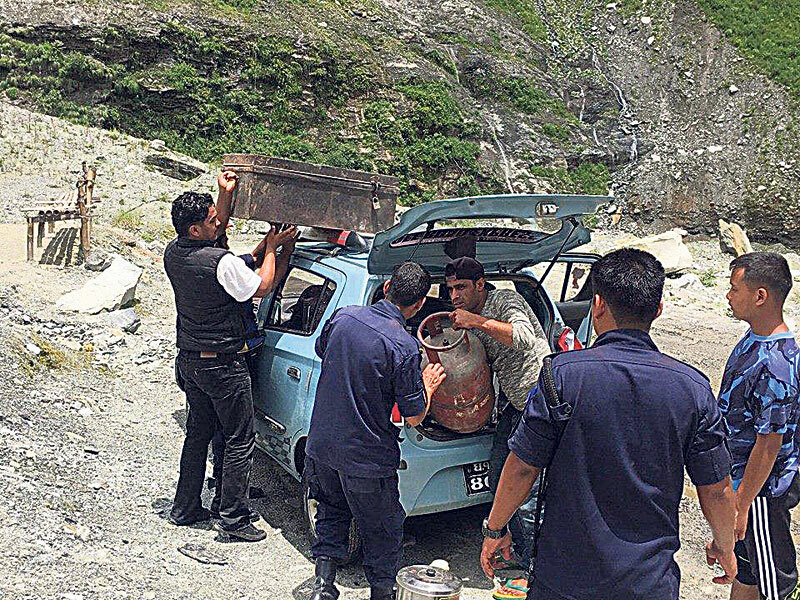 KATHMANDU, July 18: Even though almost 500 settlements in over 18 worst quake-hit districts are at risk of landslides during the ongoing monsoon, the National Reconstruction Authority (NRA) is yet to devise any plan for relocating the risky settlements to safer sites. Officials at NRA say that the process of relocating the high-risk settlements can take place only after mid-October. 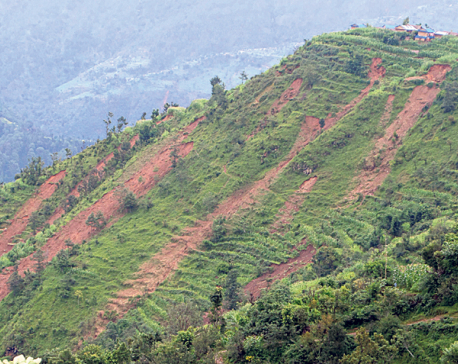 Right after last year's earthquakes, the Ministry of Home Affairs had stated that as many as 475 settlements in 18 various districts may be at risk of landslides during the monsoon. The Department of Mines and Geology carried out a survey in the 11 worst-affected districts and identified up to 117 settlments as vulnerable. But more than 15 months after the big quakes, NRA has not taken any concrete steps in the resettlement process. Instead, NRA is planning to carry out a new survey of settlements deemed risky by the Home Ministry, informed NRA's Chandra Bahadur Shrestha, who oversees the task of relocation of risky settlements. "The Home Ministry had identified 475 risky settlements but the study was carried out in haste and was not very scientific. So, we are working to carry out a new survey and finalize the number of settlements that really need to be relocated. Only after this survey is completed will the real task of relocating risky settlements begin," said Shrestha, adding that it will take nearly three months for the survey to be completed. NRA has even decided to postpone distribution of the grant amounts of Rs 200,000 until new arrangements are made for quake victims in the high-risk settlements. All the 475 settlements are at risk of landslides but all of them may not need to be relocated, Shrestha said. "So, we have decided to carry out a new survey to identify the real situation of the settlements and decide how many settlements need relocation," he said. The relocation process will take time as NRA needs not only to identify the settlements at risk but also the safe locations for the relocations. He further said NRA has directed the local bodies to temporarily relocate settlements that are prone to landslide. "NRA has constructed community shelters in various places and we have directed the local authorities to shift such risky settlements there until NRA comes up with a concrete plan for relocation." NRA is preparing to deploy teams of engineers to re-assess the risky settlements, Shrestha said.